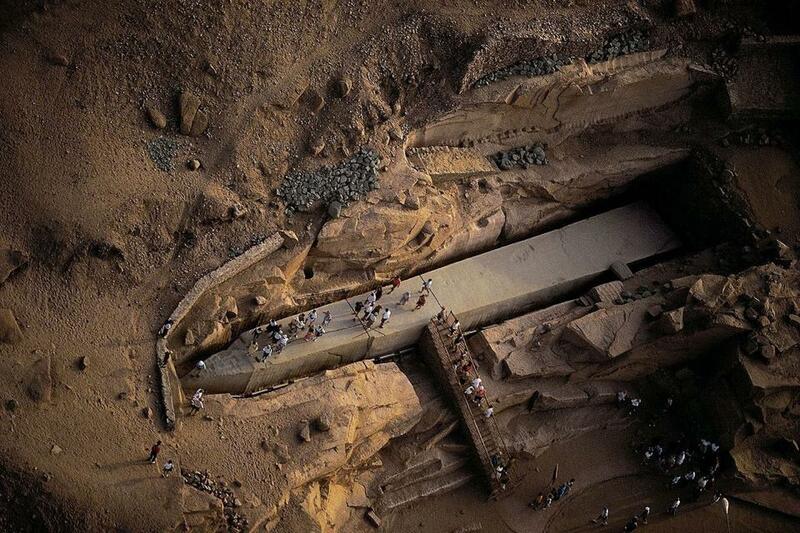 The Unfinished Obelisk at Aswan dwarfs archaeologist Mark Lehner. No rock speaks such volumes as the Unfinished Obelisk. Commanding the presence of a lost city from its rocky bed in an ancient quarry high above Aswan, it speaks of the hubris of the pharaohs and the grueling labor of their minions, of the triumphs of quarrying and its unimaginable failures. Had it ever made it out of its stone cradle and assumed its position before Karnak (or wherever its creator planned to place it), it would have been the greatest obelisk ever raised, a monument worthy perhaps of “Wonder of the Ancient World” status. As it is, the Unfinished Obelisk is the obelisk raisers’ most grievous tragedy, a lasting reminder of the limits of human engineering. If it had been extracted and erected as originally conceived, the Unfinished Obelisk would have stood 137 feet tall and weighed 1,168 tons, dwarfing all others. (The largest survivor, the Lateran obelisk in Rome, rises 105 feet and weighs 455 tons.) However, months or perhaps years into its removal, fissures began to appear in the granite. With each crack, its designers scaled back the size of the obelisk, but each time the quarrymen came upon a new one. When they uncovered a profound fissure near the obelisk’s center, the project was abandoned. Crouching in the trench made by ancient quarrymen, Denys Stock, an expert on ancient Egyptian tools, demonstrates how the quarrymen might have wielded a dolerite pounder to carve out the obelisk. Every great monument has its great chronicler, and the Unfinished Obelisk has Engelbach. Chief Inspector of Egypt’s Antiquities Department in the early part of this century, he fell under the obelisk’s spell as completely as Carter did with King Tut’s tomb. In 1922, the year he had it cleared of the rubble that covered all but 20 yards of its upper shaft, Engelbach published a slim but seminal volume, “The Aswan Obelisk, With Some Remarks on the Ancient Engineering,” and a year later, a more popular version. It is to Engelbach that we owe much of our understanding of this extraordinary artifact. Each worker is thought to have worked a pair of scallops, pounding away the granite inch by brutal inch. As I stepped through the deep, rock-hewn trenches that define the obelisk, my shoulders brushing the rock on either side, my mind was not on the pharaohs, however, but on their quarrymen. For months and months, in that cramped space under the unrelenting sun, and all for naught, they had bashed out those scalloped trenches with cantaloupe-sized pounders of dolerite. Engelbach estimated that at any one time 130 men each worked a pair of scallops, in a space about four feet square. At Hamada Rashwan’s quarry, I got a nasty taste of their job—minus the cramped space and the pressure to succeed. Cupping a greenish-black dolerite ball in my hands, I brought it down with a crack onto a block of granite. Over and over, I bounced it on the same spot, till I thought I’d scrape the skin off my palms. After ten minutes, my wrists hurt from trying to guide the 12-pound rock in at an angle—the better to break the granite—and stabs of pain began shooting up my arms. Mark Lehner recalled that after once pounding for several hours, he could barely type on a computer. (“All I wanted to do was smash the keys,” he said.) I did it for only 20 minutes, and all I had to show for it was a baby’s palmful of granite dust. And the granite’s surface looked no different than when I’d started.Imagine, then, doing this for hours and hours, day in and day out, for months on end—for your life. (Your life must have been brutally short.) Though evidence for slavery in this context is inconclusive, the labor was certainly compulsory. (As Lehner put it: “They didn’t have Locke or Hobbes, no concept of individuality or freedom, no unions. It’s hard to think it was fun.”) If there was a silver lining to the abandonment of the Unfinished Obelisk, I thought, it was that the workers were spared having to pound it out underneath, which must have been the most back-breaking work of all. But then again, perhaps they felt cheated after all that effort. Stonemasons proudly pose with their near-finished, 25-plus ton obelisk.